Candidate Seeker, Inc. ("The Company", "North American Job Bank", "Candidate Seeker", "North American Job Bank Web Sites", "We", "Us") provides the North American Job Bank Web Sites and all related services ("Services") including the content and computer code subject to the terms and conditions included herein and subject to Your compliance with the terms and conditions included herein. The North American Job Bank Web Sites include a diverse set of features and services, including an Internet-based service to post jobs, search jobs, apply for jobs, submit resumes and create publicly displayed documents, which may include personal information or company information. Please read this page carefully. It contains the terms and conditions (the "Terms and Conditions") governing Your access to and use of the North American Job Bank Web Sites and the Services provided by Candidate Seeker, Inc. or its divisions. If You do not accept these Terms and Conditions or You do not meet or comply with their provisions, You may not use the Candidate Seeker, Inc. or North American Job Bank Web Sites and/or Services. These Terms and Conditions are amended and effective as of November 20, 2010. If You do not agree to these Terms and Conditions, do not use the North American Job Bank Web Sites or Services. change any charges or fees for use of the Web Sites, including increasing fees or charges for the use of the Web Sites or Services or Features or Content. The Company may revise these Terms and Conditions at any time by posting an updated version to the North American Job Bank Web Sites and any changes will be effective immediately upon posting. You agree that such changes are binding on You and You shall review the most current Terms and Conditions any time You visit the North American Job Bank Web sites or use Services. Your use of the North American Job Bank Web Sites or Services after a Terms and Conditions update shall confirm Your acceptance of such changes. Upon The Company's request, You agree to endorse a printed version of this Agreement. The Company may suspend or terminate use of some or all of Services to You or suspend or terminate North American Job Bank Web Sites access by You if You violate terms of this Agreement or for any other reason at The Company's discretion. You agree not to use the North American Job Bank Web Sites for any unlawful purpose and within the intentions and acceptable use defined by The Company. The North American Job Bank Web Sites are intended for individuals searching for jobs and applying for jobs and for employers and/or recruiters seeking job candidates. The Company is the sole interpreter of the North American Job Bank Web Sites' intended and acceptable use. You acknowledge that the North American Job Bank Web Sites may include inaccuracies or errors, or content that violate these Terms and Conditions and that unauthorized and/or unknown additions, deletions and alterations could be made by third parties to the North American Job Bank Web Sites. You confirm that You are 13 years of age or older and must be 13 years of age or older to visit or use the North American Job Bank Web Sites or Services in any manner, and, if under the age of 18 or the age of majority as defined in Your jurisdiction, shall only visit or use the North American Job Bank Web Sites or Services under the supervision of an adult parent or legal guardian. Upon visiting or using the North American Job Bank Web Sites or Services or accepting these Terms and Conditions, You represent, declare and certify to The Company that You have the legal right, competency, authority and capacity to agree to and abide to the herein Terms and Conditions, that You are at or above the age of majority in your jurisdiction, and that You will only use North American Job Bank Web Sites for lawful purposes. 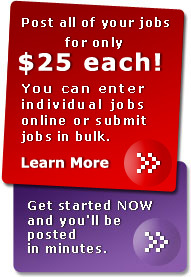 The North American Job Bank Web Sites, including all computer software code, content and graphics are the sole property of Candidate Seeker, Inc. and Portal Prodigy, Inc. and their licensors, and all rights are reserved under the protection or jurisdiction of the United States and foreign copyright, trademark and other applicable laws excepting the limited licenses expressly and specifically granted in these Terms and Conditions. You affirmatively agree not to reproduce, modify, copy, reverse-engineer, display, sell, or distribute the data, content, jobs, posting, job applications, resumes, profiles or other information on the North American Job Bank Web Sites for public use, selling, resale, data list, database or commercial application or in any other website. No portion of the content, data, computer software code from the North American Job Bank Web Sites may be reprinted or republished in any form except the explicit Intended Use without The Company's written permission. "North American Job Bank" is a trademark owned by The Company. The North American Job Bank Web Sites is owned and operated by Candidate Seeker, Inc. in partnership or association or licensure with other entities per agreements and may involve the use of their copyrighted, trademarked, patented and otherwise protected intellectual property and You acknowledge, represent, declare, certify that You do not acquire any ownership rights by using or visiting the North American Job Bank Web Sites or Services. The North American Job Bank Web Sites may contain links to other web sites operated by entities other than The Company. You acknowledge the that The Company does not control and The Company does not endorse any other web sites, and The Company has not reviewed or approved any content that appears on any linked web sites and that The Company is not responsible for any content that appears on any linked sites and if You access linked third-party Web sites, You do so at your own risk. The Company may investigate allegations of violations to the Terms and Conditions at its sole discretion and determine whether to take action. You acknowledge, declare and certify that The Company has no liability or responsibility to You for performance or non-performance of such activities. content that may create liability for The Company, damage The Company's brands or public image, or cause The Company to lose the services of its Internet Service Providers or access to other networks. When You provide The Company with contact information including email address, fax number or phone number, You expressly permit The Company and its affiliates to contact You using the supplied contact information to offer job opportunities and job and career related services and products. The North American Job Bank Web Sites are a job posting archive, which does not regularly expire job openings from public display even after they have been filled, terminated, modified or cancelled. You acknowledge, declare and certify that You shall have no ownership rights in any account, profile, job posting, or other information or data You submit to the North American Job Bank Web Sites or Services, and that if You cancel Your account, job postings or other submissions, those shall not be removed from The Company's database or the North American Job Bank Web Sites and that The Company, its affiliates and third parties may retain copies of Your information including but not limited to any resumes or job applications You may have submitted in the case of job applicants and job postings in the case of employers, the use of which The Company may have no control over. If You are an employer or You legally represent an employer, then by submitting content through the North American Job Bank Web Sites and/or Services, including but not limited to job postings, job descriptions, and/or company information, You grant The Company and its affiliates a worldwide, irrevocable, perpetual, fully-paid, non-exclusive, royalty-free license to reproduce, adapt, distribute and publish that content. You agree to pay all charges incurred by You or any users of Your account at the prices in effect when such charges are incurred, as well as any applicable taxes. Certain Services of the North American Job Bank Web Sites may be subject to additional fees or terms and by using such Services You agree to be bound by the additional terms. If You are a job applicant or candidate or You legally represent a job applicant or candidate, then by submitting content through the North American Job Bank Web Sites or Services, including but not limited to contact information, career profile, resume, curriculum vitae, and/or job application, You grant The Company and its affiliates a worldwide, non-exclusive, irrevocable, perpetual, fully-paid, royalty-free license to reproduce, adapt, and distribute that content. The Company passively channels visitor and user content to the Internet and does not screen such content nor shall You interpret The Company to screen such content and You agree that The Company has no obligation to screen such content, in advance and is not responsible for screening or monitoring content posted by visitors or users. You acknowledge, declare and certify that The Company does not represent or guarantee the truthfulness, accuracy, or reliability of any user content, job postings, advertisements, candidate profiles, job applications, resumes, curriculum vitae, company profiles, or any other content or communications posted by visitors or users or endorse any opinions expressed by visitors or users. You acknowledge that any reliance on any information, data, or content posted by other visitors and/or users is at Your own risk. The North American Job Bank Web Sites are a channel providing a place for employers and recruiters to present available job opportunities and a channel providing a place for job candidates to submit their resumes and/or to apply for jobs. The Company does not evaluate, screen or validate candidate submissions, candidate applications, candidate resumes, company profiles, job postings or other information presented through the North American Job Bank Web Sites or Services. The Company shall not be involved in or responsible for any transactions, if any, between potential employers and candidates. You acknowledge, declare and certify that The Company has no control over the quality, safety or legality of the content, job postings, advertisements, candidate profiles, job applications, resumes, curriculum vitae, company profiles, or any other content or communications posted to the North American Job Bank Web Sites, the truth or accuracy of such content, job postings, advertisements, candidate profiles, job applications, resumes, curriculum vitae, company profiles, or any other content or communications, the ability of employers to hire candidates or the ability of candidates to fill job openings. You acknowledge, declare and certify that You are solely responsible for the form, content and accuracy of Your resume or Your job posting or any other content You submit to the North American Job Bank Web Sites and/or Services. The Company neither warrants nor guarantees that a resume or job posting will be viewed by any specific number of visitors or users, or that a resume or job listing will be viewed by any visitor or user. You shall not consider or interpret The Company as an employer or candidate and shall not hold The Company responsible for any employment decisions made by any entity posting content, job postings, advertisements, candidate profiles, job applications, resumes, curriculum vitae, company profiles, or any other content or communications to or through the North American Job Bank Web Sites. You acknowledge, declare and certify that Internet visitor and user authentication is unreliable and that The Company cannot and does not confirm that visitors, users and/or posters are who they claim to be and You assume sole responsibility for any related risks. You acknowledge that there are risks to using the Internet, including but not limited to the risk of physical harm and exposure to strangers, foreign nationals, underage persons, and/or deceitful individuals. You assume all risks related to associating with visitors and users contacted through the North American Job Bank Web Sites. You acknowledge that it is acceptable to You that that some information may be offensive, harmful, inaccurate, mislabelled or deceptively labelled and You agree to use caution and maintain Your own Duty of Care. In the event that You have a dispute with any visitors or users, You release The Company and its employees, subsidiaries, affiliates, and agents from any and all claims, demands and damages of any kind and nature, known and unknown, suspected and unsuspected, disclosed and undisclosed, arising out of or in any way related to such disputes. You acknowledge, declare and certify that there may be certain risks, and You assume all risks related to dealing with other users with whom You have had contact through the North American Job Bank Web Sites and/or Services. You shall not hold The Company responsible or liable for any personnel selected and/or hired by Your company. You acknowledge, declare and certify that screening, interviewing, selection, retention or hiring of any individual or entity is based solely on You and Your company's investigation, verification and determination that such hire is suitable for Your company's purposes and that You shall not base any decisions related to hiring personnel on any information from the North American Job Bank Web Sites and/or Services. You and Your company agree to and will hold The Company harmless from any claims, damages or losses incurred by Your company or any other party as a result of Your use or Your company's use of the North American Job Bank Web Sites and/or Services. You agree to and will hold The Company harmless from any claims, damages or losses incurred by You or any other party as a result of Your use of the North American Job Bank Web Sites and/or Services. Your use of any content, job postings, advertisements, candidate profiles, job applications, resumes, curriculum vitae, company profiles, or any other content or communications from the North American Job Bank Web Site. The Company may, at its sole discretion, restrict the number of applications or resumes which a visitor or user may submit to employers through the North American Job Bank Web Sites and/or Services. You are responsible for protecting Your personal information by never providing social security, credit card or bank account numbers to prospective employers and/or to any other entity through the North American Job Bank Web Site and/or Services. As an employer, You should not include contact information in the body of your job posting and more specifically do not include contact information in the Add Job field titled "Job Description" unless You desire that such information be permanently available to the public. You acknowledge, declare and certify that information included in job postings shall not be removable, modifiable and/or cancellable once submitted to any North American Job Bank Web Site. The Company does not accept or consider creative ideas, suggestions, inventions or materials other than those specifically requested in writing from a specifically named individual or specifically named entity. You agree not to submit creative ideas, inventions, suggestions, or materials. If You submit creative suggestions, ideas, drawings, concepts, inventions, or other information to The Company or the North American Job Bank Web Sites You agree that any and all submitted items shall immediately become the property of The Company subject to no obligation or confidentiality and The Company shall own exclusively all current and future rights to the items and shall be entitled to unrestricted use of the items for any purpose whatsoever, commercial or otherwise, without Your authorization or compensation to You or any other entity. Employers and their representatives are responsible for maintaining the confidentiality of their employer account, profile, login and passwords. As an employer, You shall be responsible and liable for all uses of Your North American Job Bank profile, content, advertisements and/or postings, whether or not authorized by You. 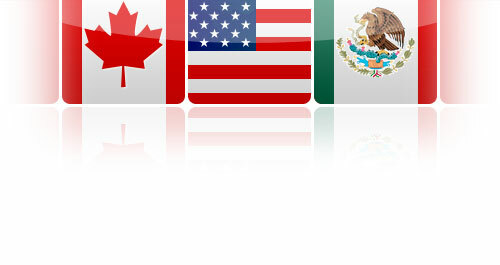 The North American Job Bank Web Sites and/or Services are meant to be appropriate and available for use in the United States of America, Canada and Mexico. If You access the North American Job Bank Web Sites and/or Services from outside those countries You do so at Your own risk and You are responsible for compliance with local laws. Access to the North American Job Bank Web Sites may be illegal in countries other than the United States of America. The Company does not certify nor claim nor represent that the North American Job Bank Web Sites may be lawfully viewed or accessed outside of the United States of America. This Agreement is entered into in the State of New Jersey, USA. These Terms and Conditions are governed by the internal substantive laws of the State of New Jersey, without respect to its conflict of laws principles and construed in accordance with the laws of the State of Jersey, exclusive of its choice of law rules. Jurisdiction for any claims arising under this agreement shall lie exclusively with the state or federal courts within Mercer County, New Jersey. You agree to submit to the exclusive jurisdiction of the state and federal courts sitting in Mercer County in the State of New Jersey for any dispute arising under or in connection with this Agreement, The Company, the North American Job Bank Web Sites and/or Services and You waive any and/or all jurisdictional, venue or inconvenient forum objections. In the event any part, portion and/or provision of this Agreement shall for any reason be held invalid and/or unenforceable under the law of the State of New Jersey or by any court having competent jurisdiction, the remaining portions of this Agreement shall be deemed to remain in full force and effect and the invalidity of such part, portion and/or provision shall not affect the validity of the remaining parts, portions and/or provisions of these Terms and Conditions, which shall remain in full force and effect. The waiver or failure to enforce by The Company of a breach of any part, portion and/or provision of this Agreement by You shall not operate or be construed as a waiver of any subsequent breach by You and no waiver of any part, portion and/or provision of these Terms and Conditions shall be deemed a further or continuing waiver of such part, portion and/or provision or any other part, portion and/or provision. This Agreement constitutes the entire agreement of the parties with respect to this subject matter and supersedes any and all prior agreements or understandings. You acknowledge, declare and/or certify that You have not relied upon any representation or statement not set forth herein made by The Company, its affiliates, employees, subsidiaries, representatives and/or agents with respect to the subject matter of this Agreement. These Terms and Conditions will remain in full force and effect while You are a visitor and/or user of the North American Job Bank Web Sites and/or Services and when You are no longer a visitor or user of the North American Job Bank Web Sites and/or Services applicable parts, portions and/or provisions of these Terms and Conditions will remain in effect. You, in addition to all other remedies agreed to above, or allowed by law for the Agreement's enforcement, expressly consent to the enforcement of the Terms and Conditions' specific performance by a court of law. Should The Company retain counsel for the purpose of the enforcement and prevention of the breach of any provision of this Agreement, including, but not limited to, the institution of any action or proceeding to enforce any provision hereof, for damages by reason of any alleged breach of any provision hereof, or for declaration of rights or obligations hereunder or for any other judicial remedy, The Company shall be entitled to be reimbursed by You for all costs and expenses incurred thereby, including, but not limited to, costs and reasonable attorneys' fees for services rendered to The Company. You agree that regardless of any statute or law to the contrary, any claim or cause of action arising out of or related to use of the North American Job Bank Web Sites or Services or the Terms and Conditions must be filed within one (1) year after such claim or cause of action arose or be forever barred. DISCLAIMER OF WARRANTY - THE COMPANY DOES NOT WARRANT THAT THE NORTH AMERICAN JOB BANK WEB SITES AND/OR SERVICES WILL OPERATE UNINTERRUPTED, ERROR-FREE OR SECURE OR THAT ANY NORTH AMERICAN JOB BANK WEB SITE AND ITS SERVERS ARE FREE OF COMPUTER VIRUSES OR OTHER HARMFUL COMPONENTS OR MECHANISMS OR THAT DEFECTS WILL BE CORRECTED. IF YOUR USE OF ANY NORTH AMERICAN JOB BANK WEB SITE AND/OR SERVICES OR THE NORTH AMERICAN JOB BANK WEB SITE CONTENT RESULTS IN THE NEED FOR SERVICING OR REPLACING EQUIPMENT OR DATA, THE COMPANY IS NOT RESPONSIBLE FOR THOSE COSTS. THE NORTH AMERICAN JOB BANK WEB SITES AND NORTH AMERICAN JOB BANK WEB SITES' CONTENT ARE PROVIDED ON AN "AS IS" BASIS WITHOUT ANY WARRANTIES OF ANY KIND. THE COMPANY, TO THE FULLEST EXTENT PERMITTED BY LAW, DISCLAIMS ALL WARRANTIES, WHETHER EXPRESS OR IMPLIED, INCLUDING THE WARRANTY OF MERCHANTABILITY, FITNESS FOR PARTICULAR PURPOSE AND NON-INFRINGEMENT. THE COMPANY MAKES NO WARRANTIES ABOUT THE ACCURACY, RELIABILITY, COMPLETENESS, OR TIMELINESS OF THE NORTH AMERICAN JOB BANK WEB SITES' CONTENT, SERVICES, SOFTWARE, TEXT, GRAPHICS, AND LINKS. YOU ACKNOWLEDGE THAT YOU ARE RESPONSIBLE FOR OBTAINING AND MAINTAINING ALL TELEPHONE, NETWORKING, COMPUTER SOFTWARE CODE, COMPUTER HARDWARE AND OTHER EQUIPMENT REQUIRED TO ACCESS AND USE THE SITES, AND ALL RELATED FEES AND CHARGES. YOU ASSUME TOTAL RESPONSIBILITY AND RISK FOR YOUR USE OF THE SITES AND THE SOFTWARE AND YOUR RELIANCE THEREON. NO OPINION, ADVICE, OR STATEMENT OF THE COMPANY, NORTH AMERICAN JOB BANK WEBSITES. OR ITS EMPLOYEES, SUBSIDIARIES, AFFILIATES, SUPPLIERS, AGENTS, CUSTOMERS, USERS, OR VISITORS, WHETHER MADE ON THE SITES, OR OTHERWISE, SHALL CREATE ANY WARRANTY. YOUR USE OF THE SITES AND ANY MATERIALS PROVIDED THROUGH THE SITES ARE ENTIRELY AT YOUR OWN RISK. DISCLAIMER OF CONSEQUENTIAL DAMAGES - IN NO EVENT SHALL THE COMPANY, ITS SUPPLIERS, OR ANY THIRD PARTIES MENTIONED ON THE NORTH AMERICAN JOB BANK WEB SITES BE LIABLE FOR ANY DAMAGES WHATSOEVER (INCLUDING, WITHOUT LIMITATION, INCIDENTAL AND CONSEQUENTIAL DAMAGES, LOST PROFITS, OR DAMAGES RESULTING FROM LOST DATA OR BUSINESS INTERRUPTION) RESULTING FROM THE USE OR INABILITY TO USE THE NORTH AMERICAN JOB BANK WEB SITES AND THE NORTH AMERICAN JOB BANK WEB SITES CONTENT, WHETHER BASED ON WARRANTY, CONTRACT, TORT, OR ANY OTHER LEGAL THEORY, AND WHETHER OR NOT THE COMPANY IS ADVISED OF THE POSSIBILITY OF SUCH DAMAGES. LIMITATION OF LIABILITY - THE COMPANY'S MAXIMUM LIABILITY ARISING OUT OF OR IN CONNECTION WITH THE NORTH AMERICAN JOB BANK WEB SITES OR SERVICES OR YOUR USE OF THE NORTH AMERICAN JOB BANK WEB SITES OR SERVICES OR THE CONTENT OF THE NORTH AMERICAN JOB BANK WEB SITES OR SERVICES OR YOUR USE OF THE NORTH AMERICAN JOB BANK WEB SITES OR SERVICES CONTENT, REGARDLESS OF THE CAUSE OF ACTION (WHETHER IN CONTRACT, TORT, BREACH OF WARRANTY OR OTHERWISE), SHALL NOT EXCEED $100. Our agent information is provided pursuant to the Digital Millennium Copyright Act, 17 U.S.C. § 512(c)(2). Upon receipt of a fully completed and signed notification form, we will disable access to the allegedly infringing materials and will promptly notify the individual who posted the materials that access has been disabled as is our obligation under the Copyright Act. If your notification is unsigned or is not on our form and does not contain the authorization language of our form, we will work with you to obtain a properly executed notification. If any of the other information is missing from your notification, however, we will not be able to respond to your request.